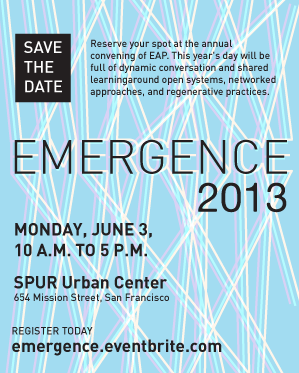 Join Emerging Arts Professionals / San Francisco Bay Area on June 3 at 10:00 a.m. at SPUR Urban Center for Emergence, our daylong annual convening. Emergence provides a collaborative platform for Bay Area arts and culture workers to connect, share ideas, and elevate their work and voices. This, our third year, revolves around three overarching themes calling for attention: open systems: talking diversity beyond butts-in-seats, networked approaches: the power of collaboration, and regenerative practices: how individuals and organizations sustain themselves. We’ve reached out to our community to gather thoughts on these topics — thoughts informing the flow of conversation throughout the day. 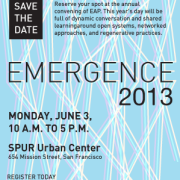 Shaking up the typical conference model, Emergence presents an experience to engage and energize. Learning will unfold in many directions, demanding your input while sparking new ideas. From the interactive morning keynote to an afternoon yoga break to the final session — a “fishbowl” exercise to synthesize the day’s ideas and lessons — you’ll be stimulated and renewed. Reflecting the very themes we’ll discuss during the day, sessions are designed to be multi-perspective, participatory, and restorative. 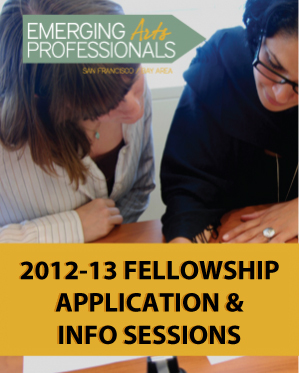 As a group, we’ll capture emerging ideas to inform our plans for the year ahead while reflecting on and celebrating the work of our outgoing fellows. Tickets are $40 with 50% discount volunteer rate available. 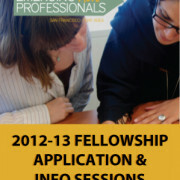 To inquire about volunteer opportunities, email adam [at] emergingsf [dot] org. To see what Emergence is all about, read the recaps from last year’s convening.